1918+ Madame Hendren Life-Like Mama Doll, 24"
This improved infant doll, that is now known to us as a Mama doll, was patented on June 11, 1918 by Averill - Hendren. It has a composition flange head, cloth upper arms with partial composition lower arms and hands, a cloth stuffed wide torso body and straight swinging cloth legs with stitched heeled feet (exclusive to Averill's doll) to simulate walking, when led by the hand. Not long after production had begun a voice box that cried Ma-Ma when tilted was added to the tummy - which is how these dolls got their name. 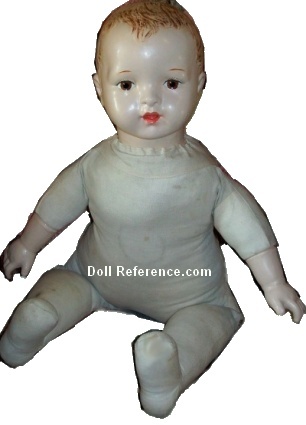 By 1921 Mama dolls were also patented in England. Of note; during 1923, 80% of all dolls requested in the USA, were Mama dolls and with their popularity and preference by 1926 costly production and high import tariff's, the German bisque doll market dominance, ended. In 1927 Mama dolls with slimmer bodies and partial composition lower legs were introduced, about 1928 composition swivel shoulder heads with full composition limbs came into use and the dolls could stand unaided. Around 1935 Mama dolls with stitched hips and composition lower legs with right and left feet appeared. By the mid-1940s Mama dolls popularity had declined. In 1946 hard plastic began to replace the composition material, as with other dolls know by "type", many Mama dolls are unmarked. Leo Grubman, B. E. Lloyd and Louis V. Aronson Voices, Inc. made voice box's for Mama dolls.